Black Hat Car hacking wizards Charlie Miller and Chris Valasek have turned their attention to autonomous vehicles – and reckon the security is surprisingly good. The duo, who work for General Motors’ robo-automaker offshoot Cruise, told this year's Black Hat USA conference on Thursday while self-driving vehicles are much less hackable than you may think, there are still serious issues that need to be shored up. Given this is an emerging and fledgling market, it's in every manufacturer's interest to get security right, to avoid one PR nightmare crashing them all. First, the good news. Because these vehicles are still being developed, and virtually no one is using them yet, there are lots of opportunities to get things right. That means building encryption and cryptographic code signing into a car’s system, minimizing the attack surface hackers can abuse, and tightly locking down communications with the outside world. More than any other kind of vehicle on the road, autonomous cars are going to be “data centers on wheels,” Valasek said. 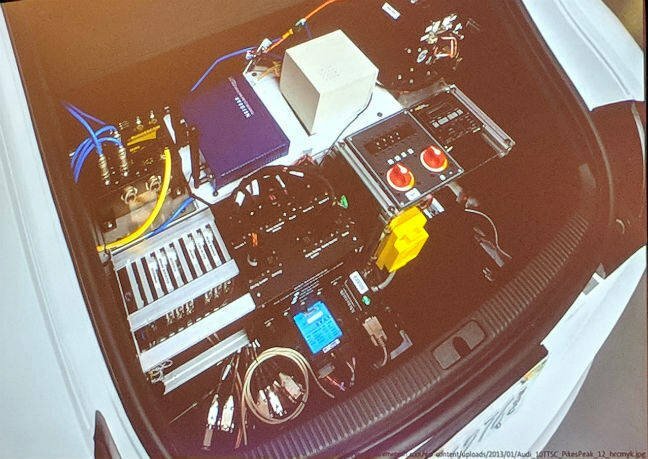 The two showed off the trunk, or boot, of Audi’s forthcoming computer-controlled motor, and it’s packed with multiple GPUs and processors, cooling systems, and sensor arrays. The vast increase in the amount of data being processed means that the usual internal controller area networks (CANs) can't cope, so instead manufacturers are installing Ethernet to spread the load. Devices on these fatter networks still have to eventually communicate with the sensor and control CANs, and the gateways between the CANs and the general-purpose network could be points of weakness. The Ethernet itself is also an issue, since it’s so basic: at Layer two in the OSI stack, encryption is not built in. That has to be improved if these cars are going to be secure, preventing one subsection from screwing around with another, they said. The other serious weak point is external communications. Autonomous vehicles are going to be updating their code, neural network models, and other datasets daily, chatting to their backend servers frequently for new information to improve their driving. Ideally, the robo-cars should not accept incoming connections, and verify everything their pick up from HQ. One area of hacking that is a complete non-starter is hijacking one of these cars via GPS tricks, such as spoofing signals to get the machines lost. Why? Because autonomous cars barely use the satellite-based positioning system. The resolution of GPS isn't high enough, so instead they rely on maps and LIDAR sensors, which are accurate within an inch or so. The other big advantage of autonomous vehicles is that, initially at least, only the rich will own one. Miller and Valasek envisage autonomous autos being introduced mainly as taxi services, such as Waymo is rolling out in Arizona; the cars won’t be sitting in driveways and public lots, but will return to base when not in use. This sharply limits the ability for hackers to get physical access to the computer, and install malware or add electronics. In terms of design, manufacturers also have the opportunity to remove physical ports to the vehicle’s data systems – since why would you let someone patch into a taxi? – and to cut down on features. For example, in a taxi, there’s no need to include a Bluetooth link to the car’s entertainment system: the passenger will only be on board for a short time. The robo-rides will also be in constant contact with the biz operating them. This means at the first sign that things are awry, the car can be remotely ordered to pull to the side of the road, shut down, and await pickup.